Kottayam, a premier commercial town, with palm fringed backwaters of Vembanad Lake and vast paddy fields of Kuttanad to the west and to its east the scenic part of Western Ghats with rubber, tea, coffee, pepper and cardamom plantation. Kottayam is an important centre of education, having led the country in achieving total literacy. 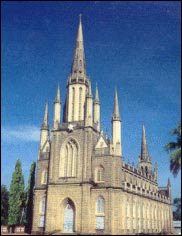 St. Mary’s Church at Valiapalli:Built in 1550 AD, this church belongs to the Knanaya Orthodox Syrian Community. 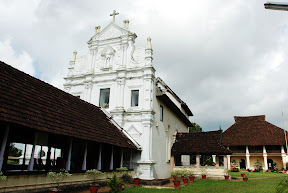 The Persian Cross brought by St. Thomas and the Pahlavi inscriptions of this church are famous and Thirunakkara Shiva Temple. Sabarimala (135 Km. ): The temple here is, dedicated to Lord Ayyappa which attracts a large number of pilgrims every year during Mandala Pooja (November/December) and for Makara Vilaku (January). The temple is opened for darshan for 41 days during Nov.& Dec. and for 18 days in January every year. The temple is also open for the first five days of every month of the Malayalam calender. The road route for the temple is Kottayam-Erumeli (35Km. )-Chalakkayam (100 Km. )Pamba (5 Km.). From Pamba travel on foot for 4 hours through the jungle to reach the temple. Area : 15.54 Sq.Km. Altitude : Sea Level. Temperature : Summer Max: 35 Deg.C. Min: 22.5 Deg.C. Winter Max: 32 Deg.C. Min: 22.0 Deg.C. Rainfall : 176 Cm. Season : October to March. STD Code : 0481. Air : Nearest airport is at Nedumbassery near Kochi (76 Km.) which is connected by Indian Airlines and private airlines with major cities in India. Rail : Kottayam is connected by rail with major cities and towns in the country. Fare: Mumbai-Kottayam II A/c. Rs.1943/- & II Class: Rs. Road : Kottayam is well connected by good motorable roads with Alappuzha 50 Km., Aluwa (Alwaye) 91 Km., Changannassery 18 Km., Guruvayur 169 Km., Idukki 130 Km., Kaladi 85 Km., Kanniyakumari 248 Km., Kochi 76 Km., Kollam 106 Km., Kozhikode 265 Km., Munnar 142 Km., Palakkad 214 km., Periyar (Thekkady) 114 Km., Sabarimala 135 Km., Thrissur 138 Km. and Thiruvananthapuram 160 Km. K.K. Road, Tel: 563661-8. Fax: 563669. Kodimatha, Tel: 303622/23. Fax: 303624. The tariff of the following hotels ranges from Rs. 200-500/- for a single room and Rs. 350-800/- for a double room. *Hotel Sakthi*, Baker Junction, Tel: 563161/81, Fax: 563151; Hotel Floral Park, Gandhinagar, Tel: 597108; Hotel Green Park, Kurian Uthup Road,Tel: 56331. Fax: 563312; Homestead Hotel,Tel: 560467, 562346. Fax: 560740; Kaycee Residency, YMCA Road, Tel: 563691-97; Nellimoottil Guest House, Tel: 560714, Fax: 300443; Hotel Nisha Continental, Sastri Road, Tel: 563984; Hotel Nithya, Gandhinagar, Tel: 597849, 598531/32; Hotel Prince, Muttambalam,P.O.,Tel: 578809. Fax: 573138; The Ambassador Hotel, K.K. Road, Tel: 563293/94. Telefax: 563755; Yamuna Tourist Home, Baker Junction, Tel: 566806. Govt. Guest House, Tel: 562219, (Tariff: Rs. 150-500);PWD Rest House, Tel: 568147, PWD Rest House, VIP Room, Kottayam, Tel: 563024, YMCA, Tel: 560541, YWCA, Tel: 560188. 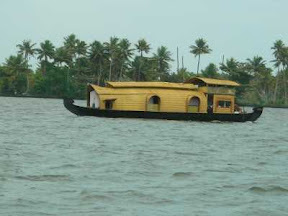 District Tourism Promotion Council near Boat Jetty, Alappuzha, Tel: 253308. Tourist Reception Centre (DTPC), Near KSRTC Bus Stn., Alappuzha, Tel: 251796. DTPC Tourist Information Centre, KSRTC Bus Stand, Kollam, Tel: 745625. 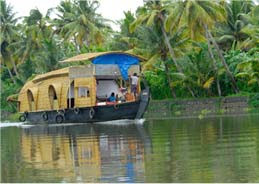 DTPC Tourist Office, Guest House Complex, Ashramom, Kollam, Tel: 742558. District Tourism Promotion Council (DTPC), Kottayam, Tel: 562315. Department of Tourism, Kottayam, Tel: 584303. KTDC, C/o. Kairali Emporium, Nirmal Bldg., Nariman Point, Mumbai. English education in South India did actually start at the Old Seminary here at Kottayam in 1813. The first printing press in Kerala was established (CMS Press) here in 1821 by Rev.Benjamin Baily. The first college in the State (CMS College) was also started here at Kottayam in 1840. Maiden printed Malayalam-English and English-Malayalam Dictionaries were published from Kottayam in 1846 and 1847 respectively. The first and only Cooperative Society of writers, authors and publishers (SPCS), for publishing books and periodicals was set up here in 1945. Kottayam is the hometown of a vast number of books and periodicals and is the center of publishing business in the State. Kottayam is the first town in India selected by the Ministry of Environment and Forests, Government of India to be transformed as an Eco City. The Sri K R Narayanan, the former President of India hails from Kottayam District. Kottayam is an important commercial centre of Kerala, India, thanks to its strength as a producer of cash crops. Most of India’s natural rubber originates from the acres of well-kept plantations of Kottayam, also home to the Rubber Board, One of the country’s primary commodities board. Kottayam, among the state’s more mountainous districts, provides some of Kerala’s finest natural scenes sandwiched as it is between serene palm-fringed backwaters on the west and the Western ghats on the east. Kottayam literally means the interior of a fort - Kotta + Akam. Rulers of Munjanad and Thekkumkur had their headquarters at Thazhathangadi in the present Kottayam town. Marthanda Varma of Travancore attacked Thekkumkur and destroyed the palace and the Thaliyil fort. The remnants of the palaces and forts are still seen here.